We, the Carnalismo Brown Berets have chanced upon yet another impostor Facebook Page, claiming themselves to have a Carnalismo Colorado Springs Chapter. To be clear, the Carnalismo Brown Berets DO NOT endorse nor have we sanctioned this individual to make such claims. The Carnalismo Brown Berets for years have already held a Colorado Chapter, that has been operating for more than half a decade. It is our sanctioned Colorado Chapter who provides oversight in the state of Colorado, and they too have NOT sanctioned nor endorsed the individual who claims to run a Chapter in Colorado Springs. This individual has NOT been issued any Carnalismo patches, nor have they earned patches or Brown Berets from Carnalismo. To make matters even more complicated, this individual has also started a “gofundme.com” account, asking for donations, in some attempt to raise money, either for their own personal gain, or personal agendas. Again to be clear, the Carnalismo Brown Berets DO NOT support this individual’s claims, nor do we support their asking of donations while trying to use our legacy and patch. The Carnalismo Brown Berets DO NOT ask the general public for donations of any kind. The Carnalismo Brown Berets fund their own initiatives respectively, and any monies raised tend to be from selling merchandise, or services that we design, create, or provide. Should anyone have any questions on the legitimacy of a Facebook Page surfacing depicting Carnalismo, or any other internet presences that might appear uncertain, we ask that you differ any inquiries to our National website, here at www.nationalbrownberets.org. Your inquiries WILL be answered, and assurances will be made. We are a transparent organization, and welcome any and all questions of our organization as-well-as our initiatives. We have seen this dynamic in the older days of “myspace,” and truer than true, much of that activity DID lead to an upsurgence of “social media activity. So here’s where the bad actors attempt to try to “hold court,” or falsely appeal to our gent with a “support page.” This has gone on for so long, that I have to wonder what they will do when Facebook is no longer relevant. that day will come, and people will migrate elsewhere onto the internet. I wish to also illuminate another fact; These frivolously launched Facebook fan pages can actually diminish the value and the honor of the Brown Berets as a whole legacy – whether being launched as a ham-fisted attempt at undermining others, you’re undermining the values and virtues which Brown Berets have classically held onto as the underpinning of the movement. Allow me to dumb that down a little: Repeatedly launching disingenuous Facebook fan pages, in an attempt to garner “band wagon” supporters will diminish the movement as a whole. It will actually water down the whole thing, and undermine it’s credibility. Truth be told, there are many bad actors using Facebook currently as a platform, and an attempt to cause disruptive distrust amongst the Brown Beret Community. I’ll go ahead and water that down some more: Irrelevant or disruptive people who think Facebook is a good place to declare your wannabe, dominant Brown Beret group is a bad idea, because it taints the Brown Beret Community, it de-values yourselves, and it mis-leads the public. How does it mislead the public? These diatribes spewed by people hung up on “ownership” of the Brown Beret legacy. It confuses people, boffos! What it means is this: Some individuals, of inferior morality basically sit posted up on the internet, trying to formulate strategies to undermine other Brown Beret groups. Much of this continuum appears to stem from middle-aged, Chicano men, with little to zero involvement en el Movimiento, even devoid of the historicity of their own families. Watering this down some more, ALL Brown Berets are susceptible to opportunists, who think they can step into the fold, and endow themselves as the determinate of what a Brown Beret is, was, or will be. Any Brown Beret group that opens itself up to such susceptibilities might want to visit an “Internal Audit” of the personalities they identify with. Honestly, any Brown Beret group that barks about their authenticity ought to do their DUE DILIGENCE on who they vet to bring into their fold. Wreckless recruitment measures, overly-ambitiousness, or enticement are ALL undertones of a gang, a cult, group-herd mentality. Herd Mentality is a concept that doesn’t surface in the Carnalismo Brown Brown Berets: We don’t subordinate our own Raza. Carnalismo is an understanding. Some people get it, some people don’t. Carnalismo is a form of understanding, which very, very few people cannot wrap their minds around. That being said, these other “internet jockey’s,” playing their little games can ride the Facebook wave all they want. When Facebook is no longer relevant, they will blindly (like sheep) scurry over to the next social media platform. And by such junctures, they might have found that ANY sense of their own privacy has been left open. Discretion and accountability have their merits. NOT Levas who exhibit hidden agendas. 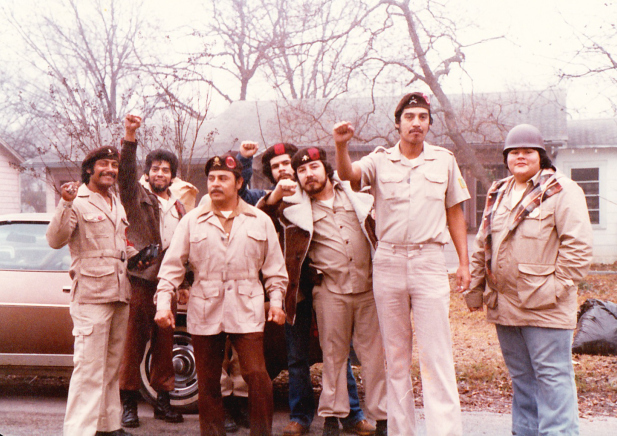 We ARE the Carnalismo Brown Berets, and we live by our own merits. And we have been around for a very, very long time. In recent months, a FAKE PROFILE of malicious intent has emerged on Facebook. Initially, the FAKE PROFILE was named after an actual Carnalismo Brown Beret, while displaying a photo of another real person. 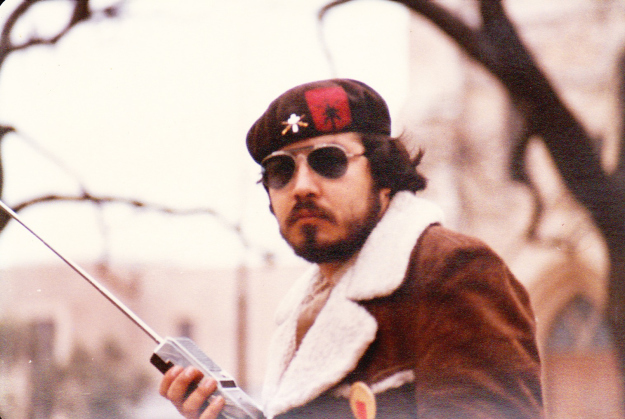 The profile picture of this real person is a “veterano” Brown Beret, who continues his work in El Paso, Texas as an activist. His work has been written about and published. 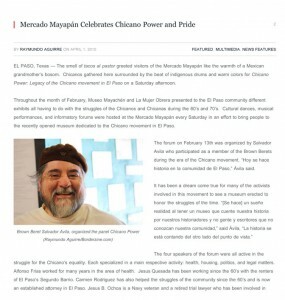 The profile picture is from an actual published article in the El Paso Times, and other numerous web and print publications, and is accredited to Raymundo Aguirre from Borderzine. It has been observed that this FAKE PROFILE has been amassing Facebook friends, and posting bizarre diatribes about Donald Trump, etc. It is obvious that the originators of this fake profile have duplicitous, malicious intentions toward the Carnalismo Brown Berets, as well as other activists. It is also worth noting that when the profile had initially launched, the two “top friends” are both members of the BBNO, in El Paso. 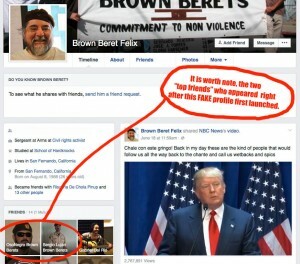 This could actually indicate that one of those two Facebook “friends” actually launched the profile themselves in an attempt to cause disruption and confusion amidst the Brown Beret Community, and other activists/organizations. We caution anyone who has been swindled into being “Facebook friends” with this profile, as it is NOT real, and obviously has pointed agendas and bad intentions. It is very sad that the individual who launched this fake profile in an obvious attack on the Carnalismo Brown Berets actually used the picture of a legitimate, humble activist who himself may NOT even be aware that his likeness is being used by malicious persons. We would provide a link to the fake profile, except that it now appears the individual who launched this fake profile has either removed the fake profile, or changed it’s privacy settings such that it is not “searchable” on Facebook. The BBNO, in its’ newest incarnation (a post Jon Burns era) have again resurfaced, with obvious ambitions toward rapacious grab ups for BOTH recruitment and expansion. Their eminent self implosion surfaced itself in the Autumn of 2011. They enjoyed a really big hype around 2010, when their “leader” appointed Jon Burns (A.K.A. Juanito, A.K.A El Gitano) to their second in Command. His title was then Chief of Staff, and there exist screen shots of BBNO proudly hailing this. But not only was Jon Burns ousted as a sexual miscreant, (who continually calls out hits on people) but he also tainted that 2010 incarnation of the “La Causa” patch. For those who don’t know, YES, many Brown Berets wear different patches, and YES, there does unfortunately exist some dispute on the validity of such patches. However, one thing that can NEVER be disputed is that the Carnalismo patch has never been rife with disruption nor dispute. Carnalismo Brown Berets are far more in keeping with some tenets of the old school, “veterano” Brown Berets, in that we DON’T operate from a place of imposing our will, and that we instead operate from a sense of understanding – in fact, that is what “Carnalismo” means in the first place. Since we don’t subordinate our fellow Chicanos with egotistical tyranny, it ALSO means that we work closely and strongly and continually with our affiliate patches – those who have humbly organized alongside us. Such is the case, with the Causa Unidos Brown Berets from El Paso, Texas. Their initiatives, and their works are so much in alignment with us, that in many respects, they are a part of our whole. When they deal with adversity, we sense and feel it. Since, however (or leading up to) the burial of Reies Lopez Tijerina (a Texan who for Land Grant rights en Nuevo Mexico), we have again seen an uproarious resurgence stemmed from people who lust to own a cause to which they have exhibit unethical ambitions. With regard to Tijerina, we WATCHED as so many greedy agencies and institutions made the passing of this defiant Tejano’s death a part of their own causes – how they were exploitative in their nature to gather own ness over the death of this man who in his life stood for justice. And though Sr. Tijerina had converted himself to another religion for long years passed, we also saw how many people tried to step into his legacy – and to grandstand their own motives for their own perceived ill gotten gains. Honestly, it was a sick, disgusting affair, to see so many destitute (or despot) organizations squeeze themselves in, for a chance to speak blank words into a microphone, into a camera, or onto the news. It could even be argued that such organizations, such as the BBNO, La Fey, etc. actually garnered more money or more followers for their duplicitous outcries – their false gritos. As a NATIVE Nuevo Mexicano, whose Abuela was from Del Rio, Texas, I felt insult coursing in my veins. Much of the embodiment of Tijerina’s work existed in my back yard, a long time ago. In his latter years, Tijerina moved back to his native Tejas, and settled into a humble life – while he was still alive, few people knew him, nor cared much about where he ended up. But the Causa Unidos Brown Berets DID! They could tell you what his favorite food was shortly before he passed away. They could tell you where he sought solace, in contrast to a lot of grandiose organizations who so hungrily salivated over owning his legacy. Few people would know his humble road as he sadly departed us all. 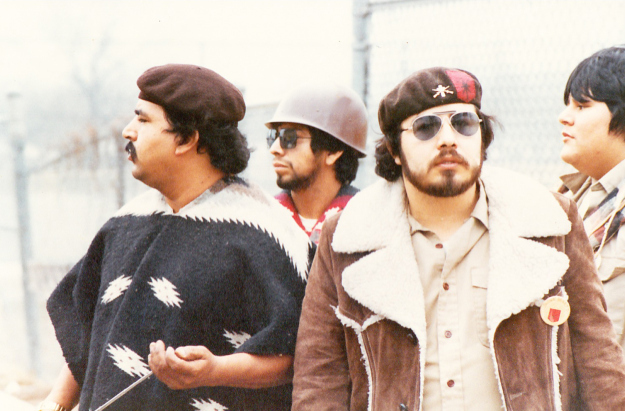 But the Causa Unidos Brown Berets were there when few paid attention to him. This “ambulance chasing” attorney out of El Paso has been hastily “promoted,” and emboldened by Jeronimo Blanco, to lead and direct the new incarnate of the BBNO. The hasty “promotions” are reminiscent of the 2010 BBNO, when Burns had been endowed as second in command. Burns only lasted a little over a year. What credibility lies with a man who barely became a Brown Beret when he was middle-aged, and why he is given so much credence? The current incarnate of the BBNO have distinctly sought to be rapacious, and to have ownership of the Brown Beret persona. Their enthusiasm shows, since they copyrighted the “La Causa” patch. 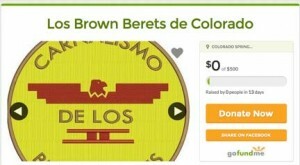 And for all the flagrantly reckless statements they make on their website, it is VERY ironic that the BBNO used the same gabacho laws they claim to be against in order to copyright the “La Causa” patch – a patch and symbol that has been in use before any of their existent leadership became Brown Berets. None of the “men” who poise themselves as leaders are even originators of the “La Causa” patch. Still, they continually “troll” on facebook, to deceive the public. 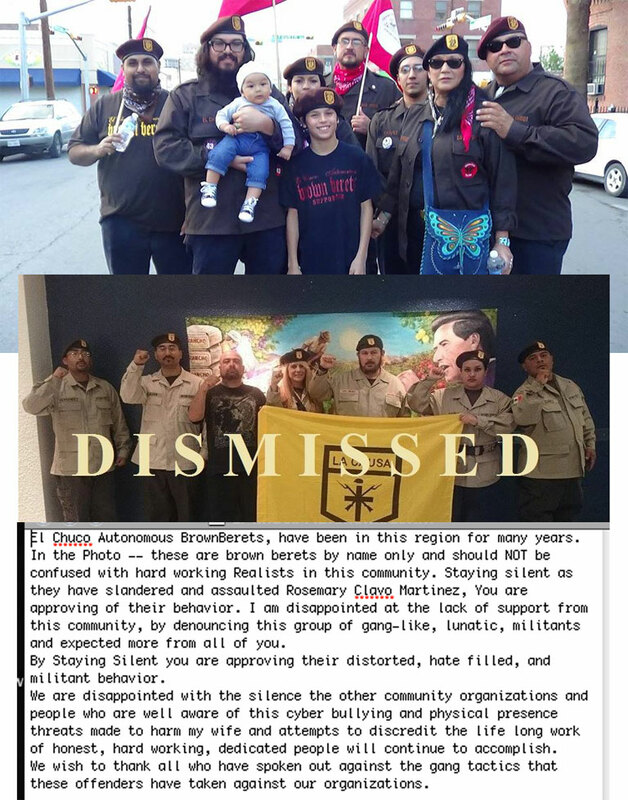 They flagrantly disrespect other Brown Berets, of other patches, and they try to harass other Brown Berets with “legaleaze,” and false cease and desist threats. This is the precipice of the problem, as it exists for Chicano activists today; the ego-stroking characters, conjuring fake adversaries, spreading libel, slander, and harassment, and implementing deception to cause unrest and disruption. To those poor saps who joined the BBNO, drank the koolaide, bought those silly khakis, the canteen belt y todo; Carnalismo feels sorry for you. We have no ambitions to recruit “puppies”, who subject themselves to be lead on a leash. We are comprised ONLY of leaders, NOT followers. And we only encourage independent thought. We challenge one another, and we UNDERSTAND one another. This is why we hold strong – BOTH with our chapters, and our affiliates. “Unfortunately, the Chicano people of the southwestern United States are going to be subject to this form of racism, which is inflicted multilaterally. It begins with a hostile environment, such as racist anglo neighbors, who pressure the local police to put the squeeze on their Chicano (or minority) equivalents. In a state where even dignitaries, media and talking mouthpieces are hostile toward Chicanos and/or Mexican Nationals/the poor/minorities it is quite easy to discriminate against a small group of individuals and get away with it. Such is the case in Longmont, Colorado – and the De Herrera family. As is often the case with our Gente we are family-oriented, and tend to have large families. Because many of us don’t make it toward “economic affluence” we as family tend to help each other out, and stick together. This is what has gone on with the De Herrera family and their household. The De Herrera’s, like many Chicano people from the southwest have a lineage in this very territory that hails back to hundreds-upon-hundreds of years. Yet, racist Anglo Immigrants – people whose lineage likely only stems back little more than a century have taken a “NATIVIST” stance against the people, the Raza whose very blood is sewn into the soil of the southwest. The hostile neighbors, in fear of this Chicano family’s tight bond have labeled them a nuisance, and have complained to the institutions and entities who share a similar bias toward the Chicano/Mexica people. Those institutions have been the local District Attorney’s Office, the conservative publication, The Longmont Times-Call, and the Longmont Police Department. All these entities (and more) have collectively and multilaterally managed to terrorize, intimidate, surveil, and threaten the De Herrera’s in an attempt to remove them from their residence. Every publicized news story in the Longmont Times-Call has shown unfounded evidence of the nuisance claims against the De Herrera’s…of course the RAG paper does all they can to elude to findings being confirmed, but their articles hold no water. We would post a link to this excrementitious news rag, but we don’t want to funnel them the web traffic. You will have to perform your own searches. The De Herrera family came to the Carnalismo Brown Berets of NM in need of help, and we are committed to helping in such cases where civil and social justice aren’t being assured, and Gente are being marginalized, segregated, or discriminated against. We as Mountain States Brown Berets will continue to combat the issues at hand. We ARE watching the situation as it plays out…Keep visiting for updates on the matter. The anonymous letter, sent to a member of the DeHerrera family.